The late Pennsylvania Gov. George M. Leader with his children (left to right) Michael Leader, President & CEO; Jane (Leader) Janeczek, Special Projects Coordinator; and David Leader, President of the George M. Leader Corp. Board of Directors. 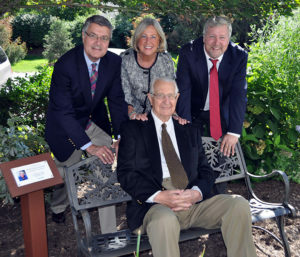 The family of former Pennsylvania Governor George M. and Mary Jane Leader has been in the profession of providing quality retirement services for older persons since 1962. The family’s main emphasis has always been to provide high-quality services at reasonable costs through a well-trained and highly motivated team of professionals. Beyond the Leaders’ involvement in the profession, their commitment has never changed—a philosophy of friendly, person-to-person caring that has become a Leader tradition. As the founders of that tradition, Gov. and Mrs. Leader had been personally interested in helping people throughout their careers. George M. Leader served as Governor of Pennsylvania from 1955 to 1959. 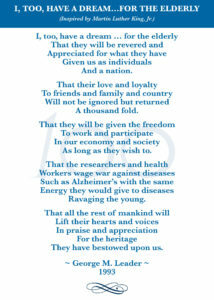 His Administration is noted for its accomplishments in promoting human welfare. Well-remembered are his programs for bringing new jobs to Pennsylvania, expanding education opportunities for the physically and mentally handicapped and improving highway safety. Others recall his efforts to bring state mental institutions out of the Dark Ages. 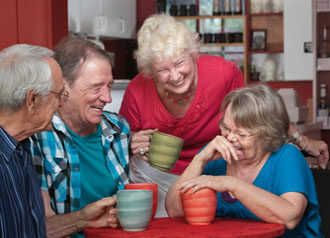 Under the Leader Administration, nursing home inspection was begun and the State Office of Aging was established. Another program of which Gov. Leader was especially proud is the state’s first licensure program for practical nurses. Today, Gov. and Mrs. Leader’s children, grandchildren and their spouses serve in various capacities to continue the family tradition of quality, compassionate care. Learn more about them in our News Media section. We hope our family earns the privilege to care for yours. On Jan. 17, 2018, Country Meadows founder former Pennsylvania Governor George M. Leader would have celebrated his 100th birthday. To honor his memory, Country Meadows campuses will host special events throughout this year including special birthday dinner celebrations, video remembrances and other occasions. Gov. 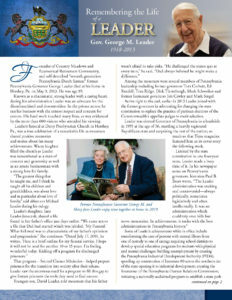 Leader passed away at his home in Hershey, Pa., on May 9, 2013. The following stories and tributes were penned in his memory and shared at his funeral. Click to read more about Gov. Leader’s life accomplishments, his time in office at Pennsylvania’s youngest governor, the chicken farming years and founding several senior living communities. Click to view this list by Gov. Leader’s youngest son, David Leader, as he recalls life lessons learned from his father and shares them to inspire others. Click to read the more about Gov. Leader’s private achievements in this emotional eulogy delivered by eldest son, Michael Leader, at his father’s funeral.